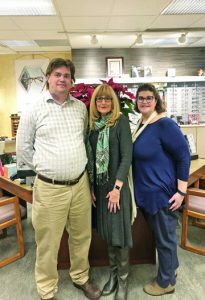 Experience Counts: Opticians Sean Innacito, Shawn Angier and Stacy Lindbloom at Cherry Creek Optical have a combined 45 years of experience. Cherry Creek Eye Center is a one-stop destination for all your vision and eyewear needs, located near Cherry Creek Drive South in Denver. Cherry Creek Optical has been part of this community for almost 33 years. The eye center has eight ophthalmologists and two optometrists. Rose Medical Surgery Center is also located in the building and some of the doctors do their cataract surgery there. The doctors provide full service, comprehensive eye exams, laser correction and cataract surgery. They use premium intraocular lenses for their cataract patients. 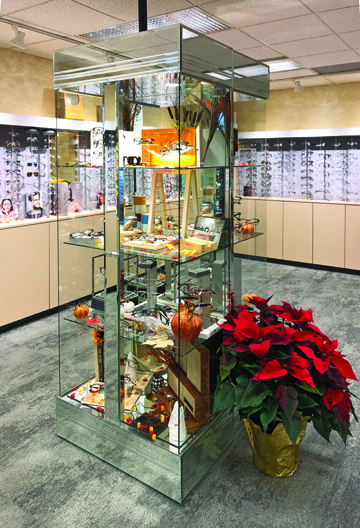 In addition to the doctors, Cherry Creek Optical is managed by Shawn Angier, who is ABO certified as well as two other opticians, Stacy and Sean, who are also ABO certified. Between the three opticians they have a combined 45 years experience. At Cherry Creek Optical you can be sure to find what you’re looking for. They have over 1,200 frames to choose from. They offer a wide selection of quality styles, brands and sizes for almost every customer at affordable rates. They also specialize in XXL frames for men and petite frames for women because they understand one size does not fit all. If you’re looking for that perfect pair of cool shades you’ll find them here. Cherry Creek Optical has one of the largest selections of Maui Jim sunglasses in the Denver area, as well as a great variety of Oakleys, Oliver Peoples, Ray-Bans, Alain Mikli, Betsey Johnson, Etnias and many more. With the holidays just around the corner now is the perfect time to treat yourself and purchase a pair of sunglasses or get a gift certificate for someone special. Cherry Creek Optical excels in customer service as well as providing quality products for their patients. They focus on educating patients on what products they need to make purchasing glasses a non-stressful experience. Their patients can be confident they won’t be steered in the wrong direction when it comes to selecting a frame and appropriate lenses. If a patient wants a subtle look, Cherry Creek Optical can show them a Silhouette frame, which is a lightweight titanium drilled rimless frame. Or if a patient prefers to be bold and make a statement they can make that happen as well. 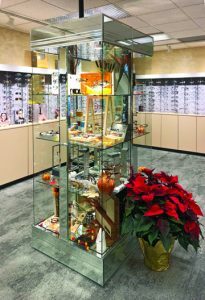 33 Years: Cherry Creek Optical is a full service eye care and eyewear center located at 4999 E. Kentucky Avenue, Suite 100 in Denver. s. The Nikon lab is one of two authorized dealership labs in the United States. And their turnaround time for a pair of glasses averages less than a week in most cases. Purchasing a pair of glasses is not only a necessity but also an investment. Cherry Creek Optical will guide you in the right direction and educate you on the many products and options out there. They are a provider for VSP, Eyemed and Superior insurances. They also honor AARP and senior discounts. They offer an economy package and have a great selection of frames for that purpose. In addition, you can use your flex dollars to purchase prescription eyewear and now is the time to use those dollars before the end of the year. Cherry Creek Optical’s goal is to establish a personal relationship with every patient because they want you to have a positive experience. It is truly more than just selling you a pair of pretty glasses; it is rewarding to know that they can assist in giving you the gift of sight. Cherry Creek Optical is located at 4999 East Kentucky Avenue, Suite 100 in Denver. No appointment necessary to come in and browse or purchase glasses. Their hours are Monday through Friday from 8:30 a.m. to 5:30 p.m. For more information contact Cherry Creek Optical at 303-691-2233.